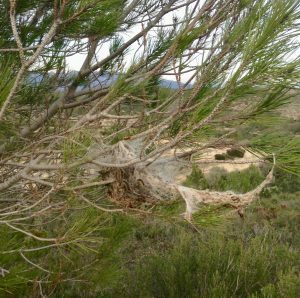 The first processionary caterpillars are beginning to be seen on the move in Terres de l’Ebre as the warm weather continues. The potentially deadly processionary caterpillars over-winter in white nests, like candyfloss, suspended in pine trees. When spring arrives, the caterpillars descend from the trees in long, nose-to-tail lines and march to find a place to bury themselves in the ground and form cocoons. They are found across Spain. Although the nests and the long lines of caterpillars that emerge from them can be fascinating, they are dangerous, particularly for dogs and young children. The harpoon-shaped hairs on the caterpillars are toxic and cause severe skin or eye irritation to humans that can last for several weeks. Some people are allergic to the caterpillars and may have more extreme reactions. If dogs explore the caterpillars with their paws, and then lick their paws, their tongue may swell up with potentially fatal consequences. Be vigilant and keep your family and pets well away from the caterpillars and their nests. Take care if you are walking in forests in the coming months. Vets advise that during springtime, particularly when temperatures are higher than 15 degrees, dogs should be kept on a lead in pine forests. If your dog (or, less likely, your cat) shows any signs of having come into contact with the caterpillars take it to the vet immediately. Symptoms of caterpillar poisoning in dogs include excessive salivation, pain and itching around the face and muzzle and vomiting. In Spanish and Catalan the caterpillars are often referred to simply as procesionaria/processionaria. Caterpillar in Spanish is oruga, and in Catalan it’s eruga. You can read a lot about the caterpillars on the internet (via Wikipedia, for example). 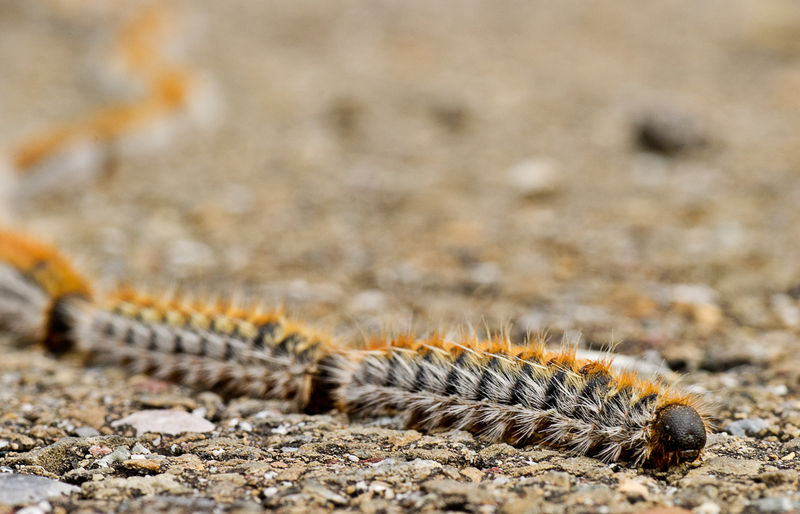 Header photo: processionary caterpillar by Ana on Flickr, published under a Creative Commons licence.